Queen Latifah (Dana Owens) as Khadijah James, editor and publisher of Flavor , an independent magazine devoted to the interests of the urban community. 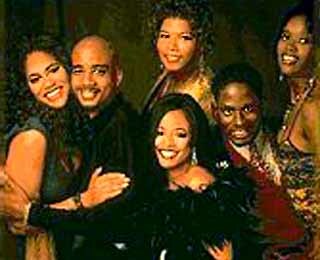 Kim Coles as Synclaire James (later Jones), Khadijah's good-natured cousin and (for the first four seasons) roommate; receptionist at Flavor and aspiring actress. Kim Fields Freeman as Regine Hunter, Khadijah and Synclaire's gossip-loving roommate; childhood friend of Khadijah. Erika Alexander as Maxine Felice Shaw, strong-willed attorney and Khadijah's best friend; spends much of her time at girls' apartment. Terrence "T.C." Carson as Kyle Barker [ episodes #1 - #107, #118 ], stockbroker and girls' neighbor; Max's verbal sparring partner and on-again, off-again etc. love interest. John Henton as Overton Wakefield Jones, Kyle's roommate and the brownstone's handyman; Synclaire's sweetheart. Mel Jackson as Ira Lee "Tripp" Williams III [ Season 5 ], Khadijah and Regine's new roommate; aspiring songwriter. 3. 1- 3     455753      5 Sep 93   Whose Date Is It Anyway? 9. 1- 9     455758     17 Oct 93   Just Friends? 22. 1-22     455771     13 Mar 94   Who's the Boss? 27. 1-27     455776     15 May 94   What's Next? 34. 2- 7     456557     13 Oct 94   Am I My Sister's Keeper? 50. 2-23     456574     13 Apr 95   Who's Scooping Who? 79. 3-25     457374     25 Apr 96   Whatever Happened to Baby Sister? 90. 4- 9     466012     14 Nov 96   Do You Take This Man's Wallet?